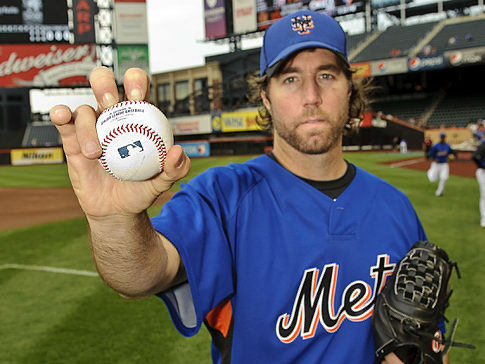 to vote for their favorite 2012 Roberto Clemente Award nominee: Willie Bloomquist (Arizona D-backs), Tim Hudson (Atlanta Braves), Jim Johnson (Baltimore Orioles), Jon Lester (Boston Red Sox), David DeJesus (Chicago Cubs), Jake Peavy (Chicago White Sox), Todd Frazier (Cincinnati Reds), Jason Kipnis (Cleveland Indians), Michael Cuddyer (Colorado Rockies), Miguel Cabrera (Detroit Tigers), Wesley Wright (Houston Astros), Alex Gordon (Kansas City Royals), C.J. 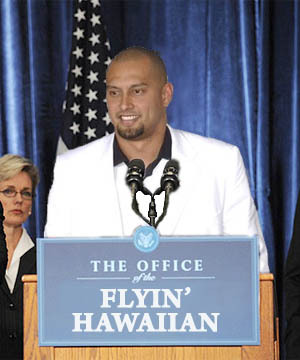 Wilson (Los Angeles Angels), Clayton Kershaw (Los Angeles Dodgers), Logan Morrison (Miami Marlins), Rickie Weeks (Milwaukee Brewers), Justin Morneau (Minnesota Twins), Johan Santana (New York Mets), Mark Teixeira (New York Yankees), Brandon McCarthy (Oakland Athletics), Jimmy Rollins (Philadelphia Phillies), Chris Resop (Pittsburgh Pirates), Matt Holliday (St. Louis Cardinals), Luke Gregerson (San Diego Padres), Matt Cain (San Francisco Giants), Felix Hernandez (Seattle Mariners), David Price (Tampa Bay Rays), Michael Young (Texas Rangers), Ricky Romero (Toronto Blue Jays) and Ryan Zimmerman (Washington Nationals). 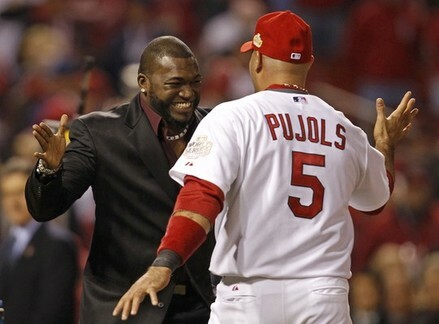 2008 Roberto Clemente Award winner Albert Pujols congratulates David Ortiz after being named 2011 Roberto Clemente Award winner before game two of the 2011 World Series between the St. Louis Cardinals and Texas Rangers. 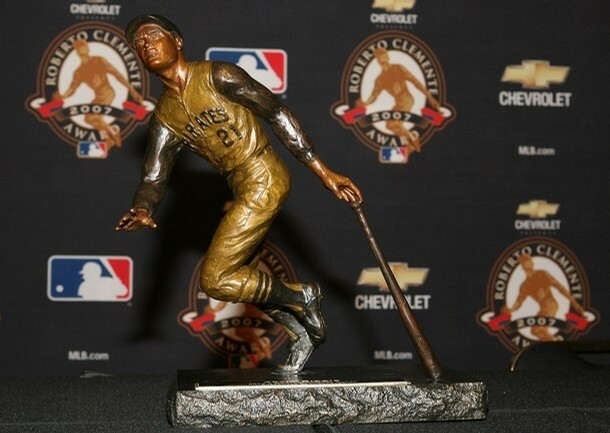 Past Roberto Clemente Award winners have included David Ortiz, Tim Wakefield, Derek Jeter, Albert Pujols, Craig Biggio, Carlos Delgado, John Smoltz, Edgar Martinez, Jamie Moyer, Jim Thome, Curt Schilling, Al Leiter, Tony Gwynn, Sammy Sosa, Eric Davis, Kirby Puckett, Ozzie Smith, Dave Winfield, Barry Larkin, Cal Ripken, Jr., Harold Reynolds, Dave Stewart, Gary Carter, Dale Murphy, Rick Sutcliffe, Garry Maddox, Don Baylor, Ron Guidry, Cecil Cooper, Ken Singleton, Steve Garvey, Phil Niekro, Andre Thornton, Greg Luzinski, Rod Carew, Pete Rose, Lou Brock, Willie Stargell, Al Kaline, Brooks Robinson and Willie Mays. 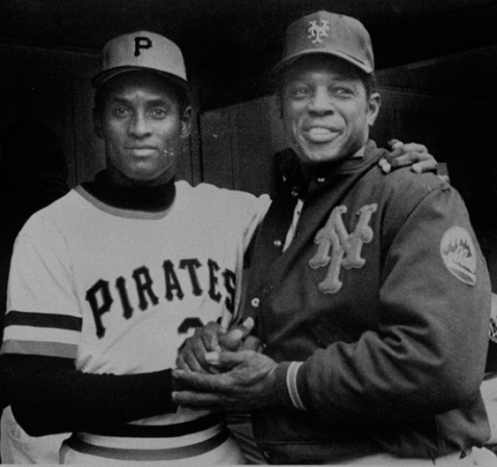 Willie Mays congratulates Roberto Clemente after hitting his 3000th and final career regular season hit in a game against the Mets in Pittsburgh on September 30, 1972.
a player, coach or executive–either active or retired–who personify Rotary International’s motto of “Service Above Self” for this nationally-acclaimed award named in honor of the late baseball executive Branch Rickey–best known as “Mr. 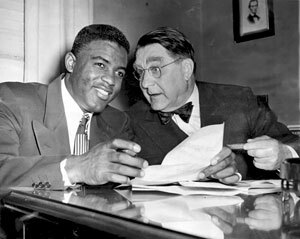 Baseball” for breaking baseball’s color barrier by signing Jackie Robinson and hiring the first Latin American to be selected to the Hall of Fame, Roberto Clemente. as well as raising money for an organization rescuing young women from forced prostitution in India. 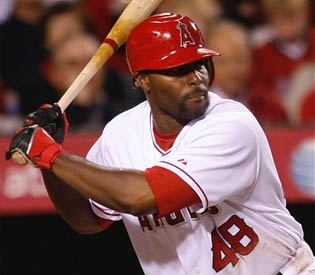 Past Branch Rickey Award recipient and Baseball Humanitarians Hall of Fame Inductee Torii Hunter’s positive impact on youth in need is felt worldwide. Tony Gwynn, San Diego Padres; Brett Butler, Los Angeles Dodgers; Craig Biggio, Houston Astros; Paul Molitor, Minnesota Twins; Al Leiter, New York Mets; Todd Stottlemyre, Arizona Diamondbacks; Curt Schilling, Arizona Diamondbacks; Bobby Valentine, New York Mets; Roland Hemond, Chicago White Sox; Jamie Moyer, Seattle Mariners; Tommy Lasorda, Los Angeles Dodgers; John Smoltz, Atlanta Braves; Trevor Hoffman, San Diego Padres; Torii Hunter, Los Angeles Angels of Anaheim; Vernon Wells, Toronto Blue Jays; and Shane Victorino, Philadelphia Phillies.